Yannick Né​zet-Sé​guin took the rare step of bringing the entire orchestra onstage for curtain calls following his first performance as just the third music director in the Metropolitan Opera's 135-year-history. The 43-year-old Canadian led Tuesday night's premiere of a new production of Verdi's La Traviata by Tony Award-winning director Michael Mayer, starring Diana Damrau, Juan Diego Flores and Quinn Kelsey. 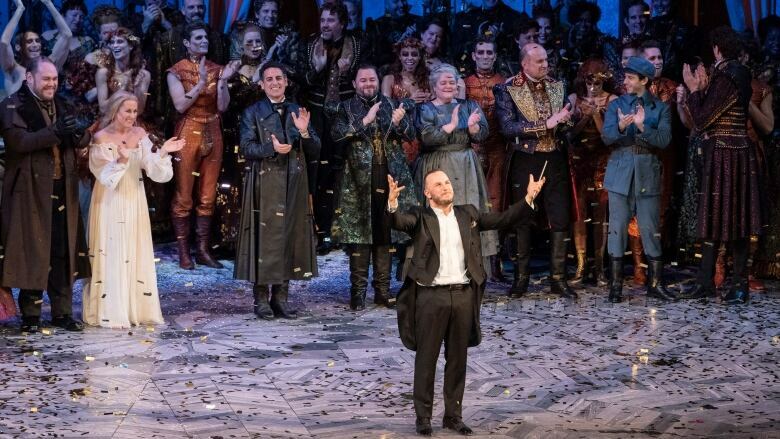 Gold confetti was dropped over Né​zet-Sé​guin during his curtain call, and the orchestra emerged from the wings to take bows behind him — rather than remain in the pit or stand as it does on other nights. "What classical music is about is human effort. It's the people behind the sounds and the visuals that we see," he told CBC's Rosemary Barton in a recent interview, explaining his desire to celebrate the orchestra's players. "Night after night, when you sit there, you have 80 people playing music live, risking. There's no tape there. There's no safety net," he explained. "There's such a collective effort in this that it's my role to feature that aspect of the teamwork even more, especially from the orchestra."